Wilson, signed it into law. In 1932, social progressive Franklin D.
dragged America into World War II. In 2007 the bankers did it again. Smart Kids at "Rock The Facts." We have until November to get it right. 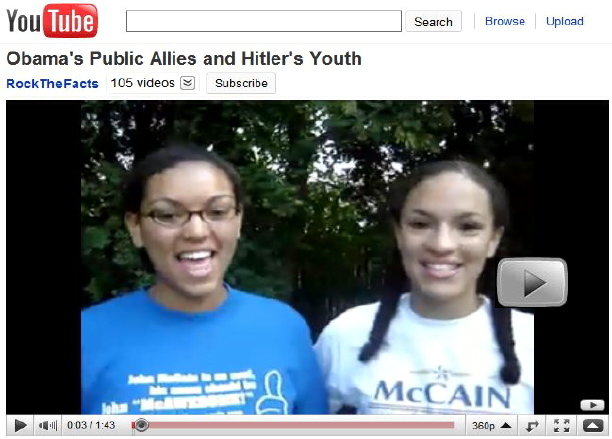 Two teens from "Rock The Facts," Tiaza (blue T-shirt) and Tiara (McCain T-shirt) attempted, prior to the Election of 2008, to tell the youthful voters of America that the media was spinning reality out of a myth. The myth? That Barack Hussein Obama was actually the popular "father figure" projected by the media. Too bad the American people were not listening. Black America closed their ears to everything except the music chimed by Obama when he spoke to black groups (sans media) and assured them, WHEN (not "if") he got the keys to 1600 Pennsylvania Avenue, he was going to begin the process of redistributing the wealth of White America back to Black America. His message? "You help me...I help you." He did begin to redistribute the wealthbut it was the wealth of the entire working class...to the rich. Obama was on the path of creating his classless society. But it would be a society consisting of two classes: the elite rulers who had everything and the working class which had nothing. Those who were actually familiar with the history of the world saw the reality of what was coming that the "redistribute-the-wealth-to-us" crowd didn't see. They saw a man who was attempting to do what another figure from history did on his journey of the conquest of a nation to hisa failed attempt to conquer the world. The man? Adolph Hitler. This time around, the Bible assures us, one man will succeed, and the world will fall to its knees and worship this man as a god. Will it be Obama? He will be the enabler, but he will fail in his attempt. But, in attempting to be that man, he will collapse the economies of the industrialized world and set the stage for the biblical figure to take center stage and capitalize on Obama's crisis. By this time, the world knows the drill. Never let a good crisis go to waste. When the Election of 2008 approached, most Americans failed to note one peripheral fact about their nation. While they were distracted by America's first mulatto presidential candidate (who prefers to deny the white blood that flows through his veins), the Constitutionally-protected free press, now owned by the same social progressive billionaires who have bought every presidential election in the United States since 1912 (with the exception of one), died. It has stopped reporting the truth and now reports the sanitized news as it is manipulated by the money barons who are now within two years of stealing the whole world. With all of the early reports of "motor voter" theft through multiple voting by "voters" ACORN recruited by ACORN, SEIU and other social progressive "voting rights" groups, the media chose to ignore the reports. Liberal talking heads countered what the Republicans were seeing was an awaking by young voters who were coming out to "make history," and what the Republicans saw was a new generation of voters. What the Republicans saw was a new form of vote fraud on a scale so massive it could not be concealed. And just for an instant Obama accidentally launched the evidence of that fraud on the White House website. In November, 2009 two lawyers filed Pro Warranto lawsuits against Obama, believing those actions would force him to produce an authentic, long form birth certificate. A pro warranto lawsuit asks this question: "By what authority do you assume authority?" Obama fooled them by posting the Election results for 2008 on the White House website without realizing there was a serious error in the numbers. 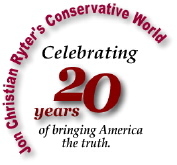 When I caught the error and posted it on my website on Nov. 28, 2009, it took the website about three years to scrub the White House site of the data, but the Federal Election Commission [FEC] website as well. This is the information that briefly appeared on both websites: there were 169 million registered voters in 2008. Eighty-six million of them were registered as Democrats, 55 million were registered as Republicans. And 28 million were registered as Independents. The White House reported that statistic. The box for the actual number of voters was empty. In the box next to the empty box it noted that 56.8% of the registered voters voted. At the bottom of the chart it noted all votes cast totaled 132,618,580. But, when you did the math, the numbers didn't jive. When you do the math and take 56.8% of the total 169 million registered voters, you discover there were too many ballots in the ballot box. There should have only been 96,992,000 actual votes cast since that's what 56.8% of the registered voters represent. Assuming, of course, that each voter voted once. But the total number of ballots in the ballot boxes totaled 132,618,580. We are left with no choice except to conclude that a lot of people voted a lot of times, (or a whole big big bunch of ballots in a whole big bunch of States were simply added to the mix before or after-the-fact and counted with the legitimate ballots). Regardless how they got there, when you do the simple math, there were 35,626,580 too many votes counted. Obama was credited with receiving 69,456,897 votes. Subtract the 35,626,580 "too many votes" and we find 33,830,317 legitimate votes cast for Obama. While the Smart Kids at "Rock The Facts didn't uncover this, they were smart enough to see there was something seriously wrong with this candidate and tried to warn the American people if they elected Obama they might find the world reliving the 1940s with one big difference. This time, we lose. WeAmericawon World War Ii because America was the strongest industrial nation in the world. American factories built the war machines, the rifles and the munitions that supplies not only American forces, but the forces of all of our allies around the world. Today, America's factories are silent. The buildings are boarded up and "for sale" signs hang on their doors. We can no longer make a widget let alone a weapon, we can't make a toilet let alone a tank, or the sleeve for a shirt let alone a war ship. We have until November to fix this problem.